BREAKING NEWS... tomorrow is my birthday! That's right... and I'm gonna be ten. Yup, it was a whole ten years ago, tomorrow, when I came into this world. A whole ten years... That's somethin' to celebrate, for sure. If you don't know the story 'bout how I came to be, you can read all about it in my post from last year entitled, "it's my birthday..."
You know... I have been truly blessed. Pals from all over the blogosphere have been sending me cards to celebrate my big day. That's right... I got mail! My BFF, Herman, from It's a Wonderpurr Life sent this neat one with me as a news broadcaster. Herman understands my penchant for bringin' the news to the world. 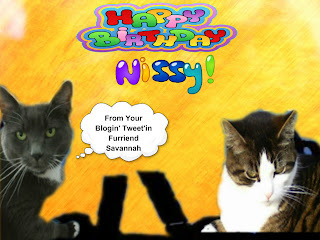 My pal Sammy from onespoiledcat sent the fun-filled card below. He knows how I love a good party. And I do! Party should have been my middle name, I think. Either that, or nip. 'Cause I do love the nip. And then the lovely Savvy from Savannah's Paw Tracks sent the touchin' card showin' her blogging to me and me blogging right back. Savvy and I are blogging buddies, you know. That sure is a nice card, Savvy. Like I said, I've been truly blessed with so many wonderful pals. But all this talk 'bout birthdays and whatnot has got me thinking 'bout names. Specifically, my name. And even more specifically, the fact that the ol' peepers gave me, a blogging MANcat, a girls' name! What's up with that? It all goes back to prehistoric times when ol' peepers was at University. There, she studied what is called, "acting." Yup, ol' peepers was an actin' major. Anywho... I guess all that make believe mumbo-jumbo stuff gave her a taste of the ol' Shakespeare. And when I say old, I mean OLD 'cause he's even older than the peep! But I digress... Because of the mumbo and the jumbo, when my siblings and I were born, peepers gave us all Shakespearean names. It's true. My sisters Beatrice and Constance were named after characters in Much Ado About Nothing and King John, respectively. My brother Desdemona was named after a character in Othello and I, Nerissa the Cat, was named after Portia's side-kick in Merchant of Venice. I guess that it's kind of neat that we were all given Shakespearean names. Somewhat sophisticated, I suppose. And they are all really pretty names. But still, none of that excuses Peep #1 for givin' Desdemona and me girls' names. I mean, she could have come up with a couple of boys' names. There are boys in Shakespeare, you know! In fact, there are way more boys than girls in Shakespeare. Way more. Of course you know that. I know that. It's only the ol' peep who doesn't seem to know it. The peep says that she didn't know that Desdemona and I were boys. She says, that 'cause we were feral and wouldn't let her near us for so long, she had no way of telling. I say, MOUSES! She could have asked our mama! Our mama knew we were boys. Peeps!!! I sure do hope that Prince William and Princess Kate do a better job of namin' their baby than my peep did of naming me. I'm pretty sure they will. I really can't imagine that they could be anywhere near as silly as my peep. I really do believe that if the Royal Baby turns out to be a boy, his parents will have the sense to give him a boys' name. Unlike my ol' peepers here who must have been absent the day sense was bein' handed out. 'Cause... you know... she gave me, a boy, a girls' name and all. But what is in a name, anyway? This gal named Juliet once said, "A rose by any other name would smell as sweet." So I guess that means that even though I am a boy who was given a girls' name, I'm still a boy. Givin' me a girls' name doesn't somehow make me a girl, right? I'm pretty sure that's what Juliet meant. I don't think she was actually talking 'bout roses. Even though roses do smell sweet. And I'm really sure that she wasn't talking 'bout rose-scented litter boxes or anything like that. I don't think they even make rose-scented litter boxes. Unless, of course, you happen to be a cat livin' in a house with a rose garden. Wait a minute. Just wait a cotton nip picking minute there. I'm a cat. I'm a cat who lives in a house. I'm a cat who lives in a house with a garden in which some roses grow. That means... I have a rose-scented litter box! Wow, they do make 'em. Maybe that's what Juliet meant all along? I'll have to have a little think on that one. Yup, I really do think I will. oh my cat - seriously? Why that...that...that means WE have a rose-scented litterbox too. What are the odds? And your birthday and Maxwell's are suspiciously close, we might add. More to ponder, indeed. A very Happy Birthday to you Nissy.WE love how you got your name. That is great. We really did think you were a girl and we do apologize. Hope you have a great day tomorrow. HAPPY BIRTHDAY to us !! We went back to last year's post and read the details of your birth and "adoption". Heartwarming story, Nissy. We sure do hope that birthday #10 is your very best one ever. I guess the roses are not out yet, but maybe you will get a lot of nip! Happy, Happy Birthday Nissy and here's to many more. Happy birthday, Nerissa! :) Many happy returns. Happy early Birthday, Nerissa! Just imagine if your peep had named you after Shakespeare (and not after his characters). You could have been Shakey! Happy, Happy, Happy Birthday to you and I hope your special day is special!!! Happi birfday my pal - I knoze it gonna be 'da best pawsome day e.v.e.r. Happy Birthday early, Nerissa! We think you have a very interesting name. There's not many other kitties out there with your name which is pretty cool! My Human teaches Hamlet and there's lotsa good boy names in that--course one a them is Hamlet which kinda sounds like omelet--oh nevr mind. Gosh, it's your BIRFDAY!? Happy Birthday, my furiend! I hope you have a FABULOUS time on the Birfday when you moves into Double Digits. I will be nine soon, so next year I will get my DD's. A Big Happy Birfday from ur Pal Spitty which isn't really a girl OR a boy's name--in fact, it's not even a real name at all. Sigh. 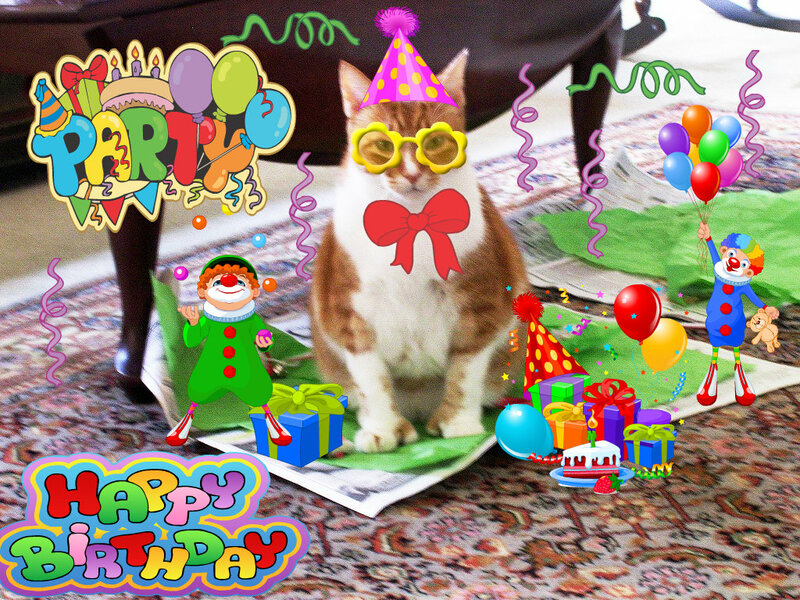 Hope you have a very lovely birthday, fit for a handsome gentlecat! We've commiserated before about our names. Nissy sounds like the affectionate name they call the Lake Loch Monster. That's gotta be a boy, and kinda cool in a monsterly way. I get Quinnie. Blah! Furrst of all - a Very Happy Birthday to you, Nissy! I do so sympathise about the name, but, in spite of all that, we ladycats are well aware that you are a MANcat - and a very handsome one at that. (Mummy says I should stop flirting). Happy Birthday, I do hope we are having a pawty! We likes your name and think it would make a lovely name for the Royal Baby. happy birthday Nerissa! We don't receive your blog in email til late in the day so we are saying it now and then we will say it again, hope you have a fabulous day! Wishing you the happiest birthday, Nerissa! We hope it's a very special day! Happy Birthday, Nerissa! Ten is a good age. Happy 10th Birthday to you Nerissa! Hugs and purrs! Cause he is a Shakespearean Kittah Fur-Sure! Purrs from all of us on your 10th B-Day Dood! Woo hoo! Happy Birthday Dear Nerissa! And many more...I'z got my jazz paws going for ya full force and wish you a day full of mountains of the best nip ever! Rock on buddy! Hey, If Wills and Kate have a boy, he could be King Nerissa someday ! What's in a name...right? Happy Purrthday, dear furriend! Hope you had a great day and purrs to many more years! Happy bday. I (lassie) totally know how u feel about being a boy with a girls name. Trust me. Happy Happy Birthday Wishes, Nissy!!! I can't find it either. Blogger must have eaten it for lunch, or somethin'. MOUSES! Many many belated Birthday Greetings!!! !